While visiting a family friend a couple weeks ago, the boyfriend and I got to try some rosemary shortbread cookies from a bakery. 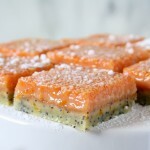 They were phenomenal, and I knew I wanted to try recreating them at home. 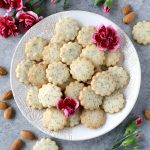 I tweaked the recipe from my hazelnut coconut shortbread cookies, omitting the hazelnuts and coconut and adding rosemary that I dried in the microwave. 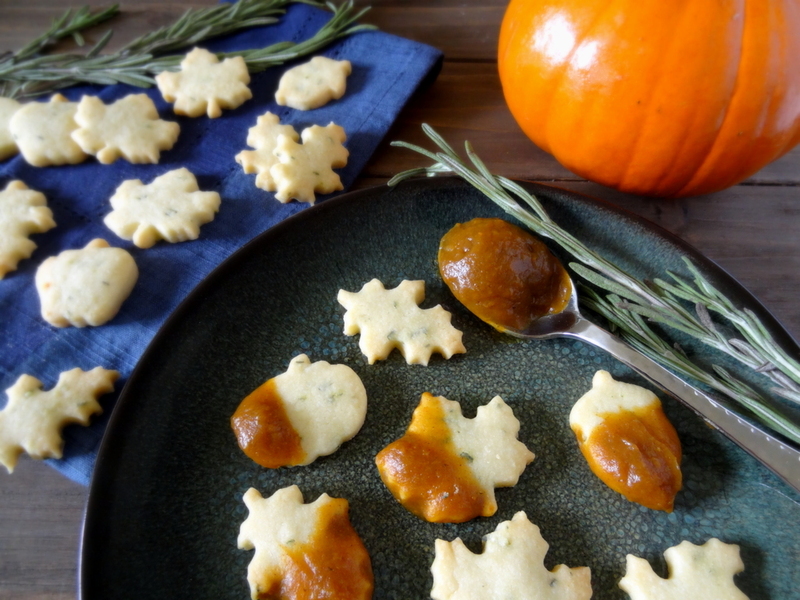 I was pleased that they turned out remarkably similar to the bakery version – smooth and buttery, faintly sweet and with a touch of pine-like aroma from the rosemary, a flavor I find to be highly evocative of autumn. 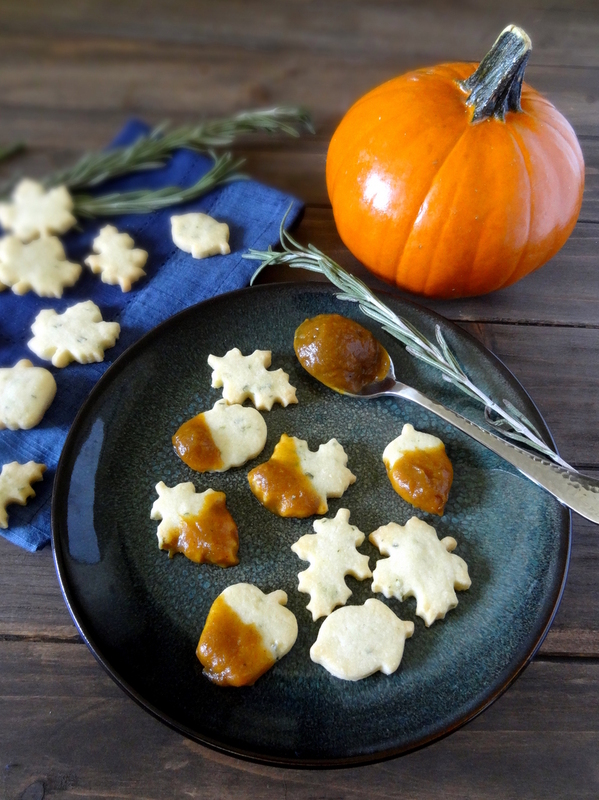 I mentioned last week that I’d be posting a recipe for something to go with pumpkin butter, and this is it: if you’re looking for a way to fancy up these cookies, dipping them in pumpkin butter is a great option! Pumpkin and rosemary are both strong flavors, but they complement one another quite nicely in this case. 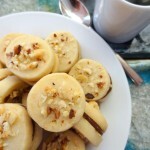 Of course, if pumpkin isn’t your thing, these shortbread cookies are exquisite on their own, as well. Enjoy! Cream together the butter and sugars until smooth and fluffy. In a separate bowl, stir together the flour, salt, and rosemary. 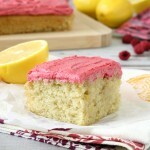 Mix the dry ingredients into the butter and sugar mixture, stirring until fully incorporated. Add the water and stir until the dough is smooth. Form the dough into a disk (about 6 inches in diameter) and wrap with plastic wrap. Refrigerate for at least 45 minutes to 1 hour. 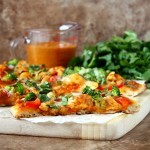 Once the dough has chilled, preheat the oven to 325 degrees. Roll out the dough on a well-floured surface until it is about 1/4 inch thick. 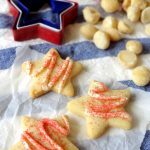 Use cookie cutters or a knife to cut the dough into cookies, and place on a baking sheet lined with parchment paper. Bake for 15-17 minutes, or until the edges are starting to turn just sliiiightly golden. Cool the cookies on the baking sheet for 5 minutes before transferring them to a wire rack. Makes about 100 cookies. The number will vary based on the size of your cookie cutters. The ones I use are about 1 1/4 inches. If you have fresh rosemary, you can dry it in the microwave. To do this, wash the rosemary and pat dry. Place the sprigs on a paper towel and place another paper towel on top. Microwave for about 2 minutes, pausing every 30 seconds to make sure the rosemary is not burning. Once the leaves crumble easily from the stem, the rosemary is sufficiently dried. Be sure to remove the stems and any flowers before chopping! Adapted from Better Homes & Gardens (December 2011). Well….shoot, CakePants. So, like I mentioned in the last comment I left to you…I came here looking for your name. 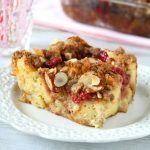 Was brought to a delicious cake recipe. 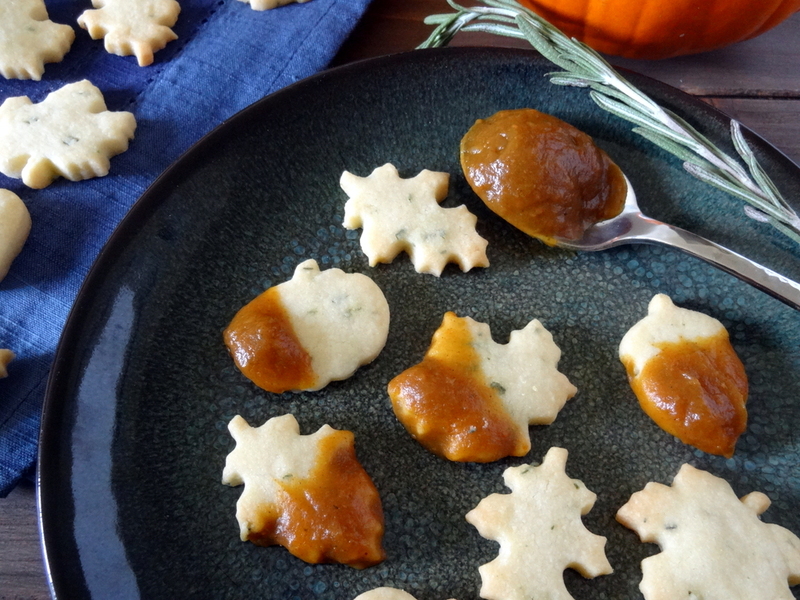 And then I clicked on your home button, which brought me to these delicious and brilliant rosemary shortbread cookies, that look so delicious with that pumpkin butter…. and now I’m looking at a picture of some decadent chocolate hazelnut truffles, that I know I’m going to end up clicking on, because they looks so delicious…and then I know there’s going to be something else that looks delicious that I’ll end up clicking on…. ….and then I wonder why I can’t ever keep up with answering comments on my own blog…or visit other people’s blogs!! 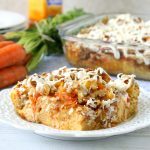 It’s because I’m always sidetracked with the gorgeous photos and delicious recipes like these! I’ll end up spending half the day looking at your wonderful recipes!! I know! What happened to September?!?! 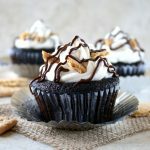 I just wanted to say that I am loving the styling of your food photos! Your photos look so good! 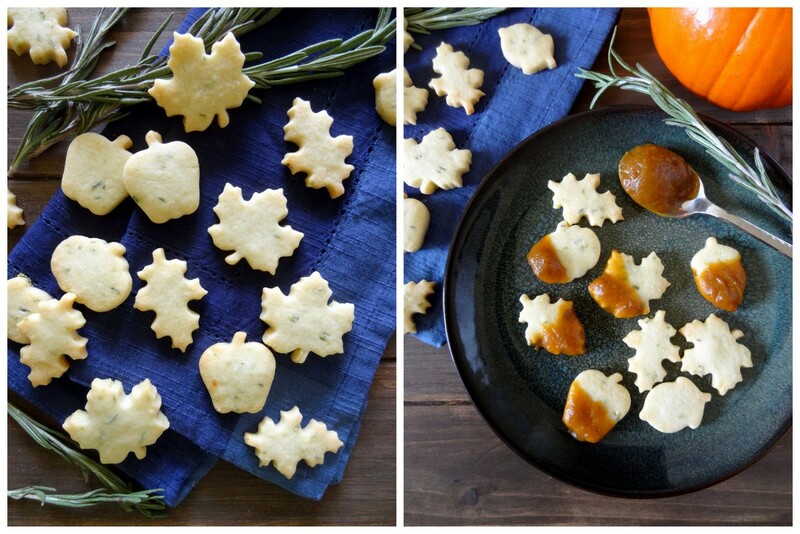 And I never thought of eating shortbread cookies w/ pumpkin butter before. Just another thing that I’ll have to try soon (you’re kind of a genius lol)! Aw, thanks so much! 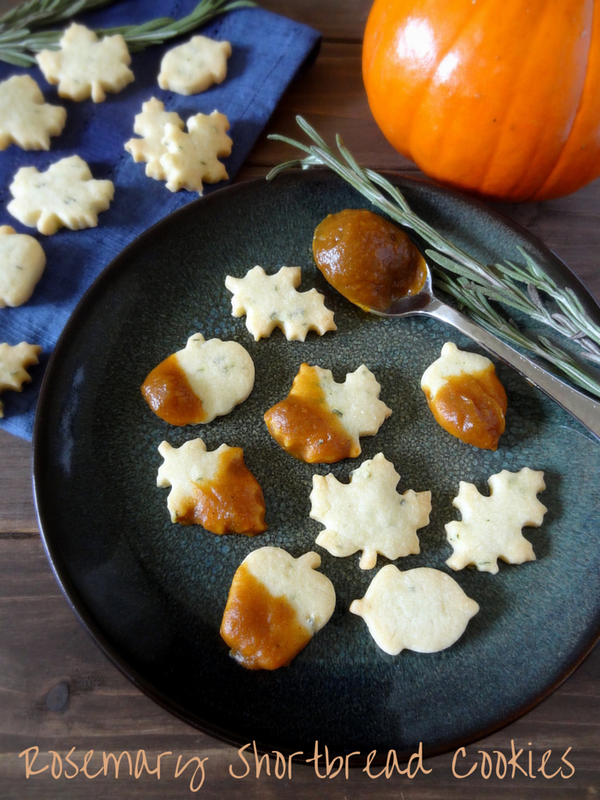 I have to admit, my inspiration for pairing these cookies and pumpkin butter was the pumpkin-shaped cookie cutter – it just seemed like something I should try, and it was delicious! I’ve been surprised by October every year since we moved to California. Wait? What? No! Etc. 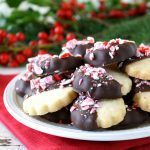 🙂 This shortbread sounds like a tasty way to ease into the season!